The company wins top honors at the Horizon Interactive Awards 2017 for a custom 3D video training program and a serious game that tests sales skills. San Francisco, Calif., April 17, 2018. — The Horizon Interactive Awards has announced its 2017 winners, recognizing the past year’s best of the best in interactive media production, and SweetRush came out on top in two categories. “Natural Inspirations,” a fully custom 3D-animated video that brings to life product technology through fun characters and storytelling, won Gold in the Video Training category. Counter Intelligence, a sophisticated, serious game for sales associates that tests their sales skills, was given top honors as well, in the Website eLearning category. Both projects were developed in collaboration with client-partner Bridgestone Americas. The full list of Horizon Interactive Awards 2017 winners can be found on the organization’s website. The winning entries showcase the industry’s best interactive media solutions, including websites, mobile applications, print media, interactive displays, public exhibits, online advertising, video, email, and more. The 2017 competition saw over 1,000 entries from around the world, including 36 out of 50 US states and 16 other countries. Dream for a moment that you have the expertise and tools to positively impact the lives of others. You can affect mindsets and behavior. You can help an organization grow, change, prosper, and thrive. The passionate pursuit of this expertise and the development of these tools have been at the heart of the success SweetRush has experienced collaborating with clients who share the same dream. SweetRush’s focus on team culture and mastery of performance improvement is reflected in loyal clients, a near-zero turnover of teammates, a 16-year track record of success, and a remarkable portfolio. 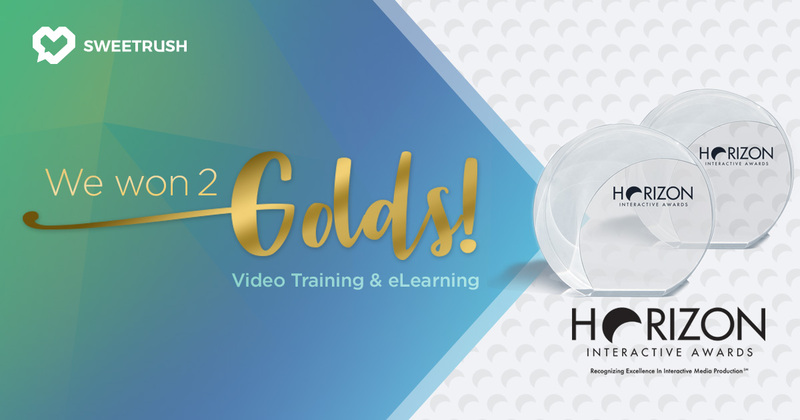 Our work with clients has earned us gold awards from our peers and high ranking on the top training industry lists. Every solution we deliver is infused with creativity. Instructional creativity allows us to discover effective and unique solutions to our clients’ challenges. Artistic creativity spurs us to create visually exciting, engaging user experiences. Technical creativity allows us to embrace new capabilities and platforms as they emerge, such as virtual reality, gamification, and mobile delivery. Cultural creativity empowers our clients to create the conditions that energize and empower their people and unleash the energy in their teams. Our Talent Solutions team builds on its unique knowledge of talent, team building, and learning and development to craft a unique, creative solution for clients who need the best temporary staff to augment their team. We apply the creative lens to all things, from project management to our treatment of our teammates, clients, and the planet. The Horizon Interactive Awards recognizes, promotes, and awards the best websites, videos, online advertising, print media, and mobile applications. Each year, the Horizon Interactive Awards receives thousands of entries from all over the world, and a volunteer panel of industry professionals, from diverse multimedia, graphic design, advertising, and marketing backgrounds, reviews all the entries to determine the work that is to be recognized.